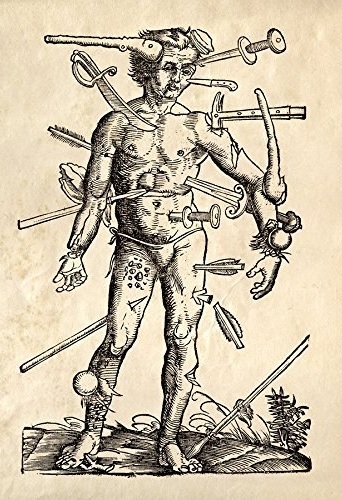 Illustration from Hans von Gersdorff’s “Feldbuch der Wundartzney”; a surgeon’s field manual from the early 1500’s. Such perfect lyrics for this particular astrological placement! The battle wounds suffered by the Chiron in Aries generation (those born between April of ’68 – March of ’77) are apt to manifest as a bit of a Wounded Warrior complex; particularly as it relates to anger. Generally the issues with this placement of Chiron tend to relate the concept of healthy self-assertion, where one knows how to stand up for themselves without going ballistic. The position of and aspects to Mars are critical to examine and especially so if any astrological contact is made between Mars and Chiron. Investigation of the Red Planet can give us an idea of whether or not one struggles to assert themselves and thus allows themselves to be dominated by bullies (which one is likely to continue being faced with until they learn how to muster the bravery to stand up to them), sweeps it under the rug and pretends it isn’t there (until it is and then oh boy look out! ), or perhaps errs on the side of having an explosive hair-trigger temper that redlines at the slightest provocation. With Chiron in Aries there can sometimes be a tendency to perceive an affront where none is intended, then react on the premise that “The best defense is a good offense”. One may find themselves embroiled in conflict, which from a spiritual point of view actually serves to push the soul toward healing wherever end of this spectrum they may be struggling with. Regardless of whether one chronically runs from confrontation or instead instigates it, healthy integration of the “Warrior” archetype is an integral component of Chiron’s “Medicine” when it is found in Aries.